By RAWKHAWK2010 - Also, I'm back. KoopaTV finally has its own advertisement video. Watch it below. As the video implies, I'm back as a full-time staff member of KoopaTV! I would like to take the Best Non-Ludwig KoopaTV Poster award for myself, now. Update 11/29/2016: The video content for this article has been mysteriously deleted and thus appropriately substituted. Please understand. Update 7/14/2017: Koopasentai is BACK! Now literally completely different, with actual aesthetic flair and no regard for chronologics. That "Future KoopaTV Staff Member" could be you. Check out the KoopaTV Jobs page for more information. KoopaTV needed a new video, especially since Koopasentai is filled with that .blogspot.com stuff. So we made one. And it's much more listenable. Rawk rage-deleted his YouTube in November 2016 and Koopasentai 1.0 was one of the few vids not backed up. The NEW Koopasentai takes inspiration from KoopaTV Adventures. I can confirm that Rawk is part of the staff again. I'll update the About page. ...oh yeah I updated the About page. You can tell because it says Updated 1/7/2015. Rock's staff position goes on and off worse than a ten-bit binary counter truth table based off a security system for a rich person living in Beverly Hills! You can print out our articles and use them as tissues. ...or just use the printer paper. That trailer needs sub-titles. Who actually thought using that voice was a good idea? ...It, um, basically does have sub-titles. ...It's literally "KoopaTV", the names of the staff members (which are provided in the video), and "Bringing Truth and Levity to the Videogame Industry" which is in the video description under "Lyrics". Does this video meet the standards you expect of material posted to this site? "Yes, as evidenced by the fact that it already has four Likes." - Rawk's logic. Anyway, people thought it was hysterical, and part of KoopaTV's mission is to get people to laugh! Rawk doesn't seem all that bright... But, if part of your mission is to make people laugh, he does have his place at the table. He brings a sort of Al Bundy charm. ...Well, regardless of how we get to that charm, we DO want people to think we're charming. Rawk said he takes your statement as a compliment. Anyway, since it's hard to watch the video without laughing for the first few times, it's a success! And hopefully people associate that laughter in the video with the site itself and come take a visit. After all, it is an advertisement video. If one watches this video in the context of what you guys do around here (i.e. they've already read a few articles here), you would be absolutely correct. If this is the first impression someone has of KoopaTV (out of context), it has an incredible amount of cringe to it. All of this is just some outside perspective. Well, I'll admit that we did not consult any outside perspectives when making this video. Which is a reoccurring theme with KoopaTV projects because we like to just release stuff without any prior announcement whatsoever. That's what happened with our major projects so far (Trayvon Tyson's Punch-Out!! and Defend Anita Sarkeesian) and obviously all of our articles are reviewed internally. It is why I also say that to "get" KoopaTV you need to read several articles!
" We're supposed to be cringeworthy to a certain audience. That's all that GAF meltdown was. They were cringing in literal TERROR." 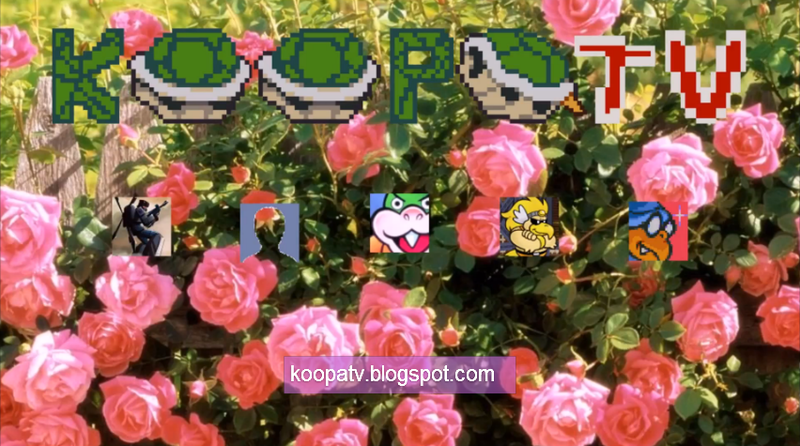 KoopaTV isn't for everyone — it's niche, after all! If you want to see us make an advertisement video intended for a wide audience, see the Planet Koopa Advertisement Video. You can tell Koopasentai isn't meant for that wide audience because it doesn't actually have any information in it. But like all niches, a generalist species can come out of nowhere and dominate you to oblivion. Well, some people are actually fans of us BECAUSE of our slant. Generalist species wouldn't be able to cover that.